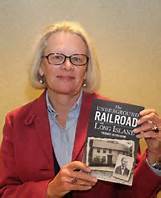 Kathleen Velsor will discuss her book The Underground Railroad on Long Island. Kathleen Velsor lives in Bayville, New York on the North Shore of Long Island. She was born in Rochester, New York. As a girl she lived in nearby LeRoy, New York - an up-state stopping point on the Underground Railroad - and remembers hearing local stories about fugitive slaves. She earned an undergraduate degree in fine arts and education from Lindenwood University in St. Charles, Missouri, and received her master’s degree in educational administration from Lehigh University in Pennsylvania and her doctorate in educational research from the University of Cincinnati in Ohio. Dr. Velsor has uncovered a rich history of anti-slavery activity on Long Island that started at least two decades before 1775, the year that the Quakers from Westbury began to free their slaves. Dr. Velsor is an associate professor in the School of Education at SUNY Old Westbury. She is co-author of the non-fiction book The Road to Freedom: the Underground Railroad, New York and Beyond, and author of Friends of Freedom: Anti-Slavery Struggle in Queens and Long Island. She speaks frequently to middle and high school students about her topic. She has received numerous grants to research the Quaker involvement in the Underground Railroad on Long Island, most recent among them an education grant from the Long Island Community Foundation to establish the Underground Teaching Partnership to build community through interdisciplinary social studies workshops for schoolteachers. From the arrival of the Quakers in the seventeenth century to the enforcement of the Emancipation Proclamation, Long Island played an important role in the Underground Railroad’s work to guide slaves to freedom. In Old Westbury, the Post family established a major stop on the freedom trail with the help of an escaped Virginia slave. In Jericho, families helped escaping slaves to freedom from the present-day Maine Maid Inn. Elias Hicks helped free 191 slaves himself and worked to create Underground Railroad safe houses in many northeastern cities. Some former slaves even established permanent communities across the island.